Nerve pain caused by conditions like neuropathy, diabetes, or even treatments like chemotherapy can be extremely painful and debilitating. Many people turn to natural alternatives like vitamins and herbs to avoid the unpleasant side effects commonly associated with prescription medications. However, not all vitamins are effective or have the same potency. Before you begin taking herbs or vitamins for nerve pain, it's important to understand the clinical studies and dosages used to get the best results. The B vitamins are considered to be of great importance in various bodily functions, including generating cellular energy and nerve function. Consuming a supplement rich in a range of B vitamins can be very helpful when it comes to fighting off the symptoms of nerve damage, and even repairing parts of the nerve. Some people may even find that nerve damage has occurred as a result of the lack of B vitamins within their body, particularly B6, thiamine, and B12. Thiamine and benfotiamine have been extensively researched and it is now known that having a thiamine deficiency can be a direct cause of neuropathy. There is also some evidence to suggest that supplementing with thiamine can help in the treatment of diabetic neuropathy in particular. The condition of peripheral neuropathy is usually one that occurs as a complication of diabetes. It is caused because of the damaging effects that chronically high levels of blood sugar can have on the body, and the associated impairment of the thiamine metabolism. Thiamine is essential for breaking down carbohydrates, but it is depleted quickly in diabetics because their cells need much more to manage high glucose levels. Benfotiamine is a thiamine derivative. Thiamine is easy to absorb in the digestive system, being fat-soluble. It is important to identify, not just the vitamin involved, but also what form of the nutrient is used. “Benfotiamine,” for example, is a fat-soluble version of Thiamine, which the body normally has trouble absorbing; this leads to frequent nutritional deficits. Research has shown that benfotiamine has an impact on the various pathways where neuropathy can be found. It also regulates the damage done at the cellular level as a result of high glucose levels. 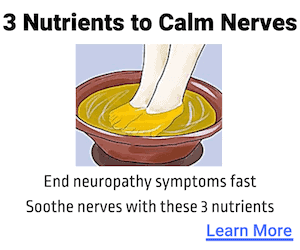 Furthermore, it helps to fight the various vascular problems that are known to have an impact on neuropathy. There have been a number of clinical trials in which it was shown that taking between 300mg and 600mg of benfotiamine daily can lead to a significant reduction of diabetic neuropathy symptoms in particular. Benfotiamine is an extensively studied and tested fat solubleN version of vitamin B1, with the highest absorption rates compared to other types. 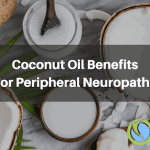 It has been shown to help reduce neuropathy related pain and reduce cellular damage caused by high blood sugar levels by improving the body's response to insulin. ​One study in Germany showed a significant drop in neuropathic pain levels by taking 100 mg of benfotiamine 4 times a day for a 3 weeks. Various studies have used the fat soluble form of the vitamin, known as benfotiamine, for its superior bioavailability in combination with the vitamin B6. Across a period of several days, the study found a huge reduction of pain reported by 95% of all participants. Objective testing found that the improvements in nerves were actually helping to repair damage and improve impulses in a significant number of patients. According to experts, individuals who suffer from nerve damage as a result of a diabetes condition can often benefit from taking a B vitamin complex supplement. However, as with any supplement, it's important to consult a doctor before using B-vitamins, as the wrong doses might lead to further nerve damage. Vitamin B12 is crucial to ensuring that the nervous system functions properly, making it another popular natural remedy for nerve pain relief. A deficiency is a direct cause of peripheral neuropathy in particular. Promising results have been uncovered in studies on both animals and humans. 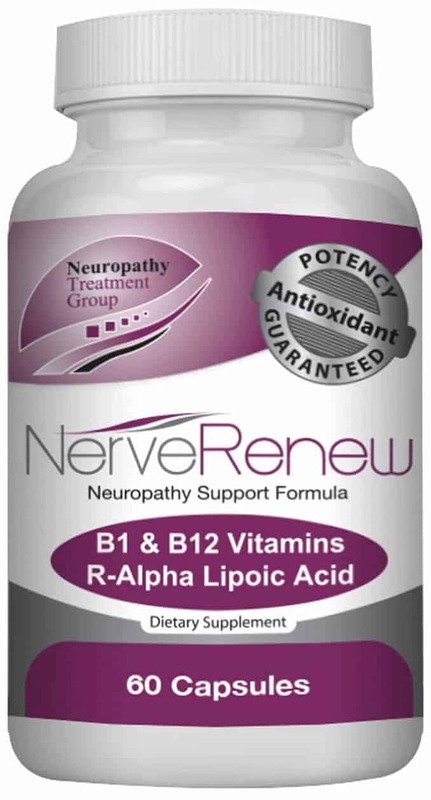 In animal trials, it was demonstrated that nerve damage caused by neuropathy can be extenuated by supplementing with vitamin B12. Specifically, the vitamin activates the specific chemical signal required for nerve regeneration. Additionally, studies have shown that neuropathic symptoms improve significantly when supplementing with both vitamin B12 and B6. ​Studies have shown that combining pyridoxal, folic acid, methylcobalamin (a form of vitamin B12) and vitamin B6 can help improve the health of the nerves in the extremities, as well as maintain healthy nerves. In another study, it was shown that the combination can also reduce how long patients with diagnosed diabetic neuropathy stay in a hospital, leading to a significant reduction in medical costs as well. Advances in science over the recent years have identified that the coenzyme form of the vitamin B 12, which is known as methylcobalamin, is perfectly absorbed by neurons where it can help to promote the rejuvenation of nerves, reduce injury, and minimize the presence of pain. Studies have shown that certain B-vitamins such as methyl b-12 help increase the synthesis of protein, which is required to regenerate the nerves. It's also been shown to support the regeneration of the myelin sheath around axons and peripheral nerves, which is responsible for proper nerve functioning and communication. Research has also shown that this particular substance can be highly effective in treating diabetic neuropathy, lower back pain, and various forms of neuralgia. Specifically, it was found that those who took 1,500 mcg daily noticed significant reductions on their level of pain and numbness, while also improving their gait. Furthermore, the studies showed methylcobalamin to be more effective than nortriptyline, which is an antidepressant that many physicians prescribe. Based on emerging science, various mechanisms can contribute to pain reduction, and these include improved nerve condition, regeneration, and inhabited spontaneous charges of pain. The effect of vitamin C has also been found to be very significant, particularly for those who have diabetic neuropathy. Studies have shown that diabetics often are vitamin C deficient, caused not by their diet but by their illness. Indeed, people with a diabetic neuropathy diagnosis often have elevated used vitamin C levels, with reduced levels of usable vitamin C. What this means is that having the condition significantly inhibits the body’s ability to store and use vitamin C appropriately, which in turn means supplementation may be necessary. It is also common for people with diabetic neuropathy to have low vitamin E levels. According to scientific research, supplementing with vitamin E can lead to a significant improvement in pain and tingling related symptoms. Furthermore, this vitamin improves overall health and nerve function in those with type 2 diabetes in particular, which is why is is often include in a holistic treatment regimen. Vitamin E is among the supplemental nutrients that can help prevent nerve damage. In addition, it's worth noting that this substance can also be particularly useful when it comes to healing the damage to the nerves. Those who struggle to properly absorb vitamin E might suffer from nerve damage as a result of those absorption issues. Many experts agree that vitamin E can help to slow down the nerve damage that might take place as a result of diabetes, as well as fight the free radicals that lead to nerve damage in the eyes, and reducing the presence of inflammation throughout the entire body. Importantly, it can take a number of months before nerves and muscles become fully enriched with vitamin E if patients have previously suffered from a deficiency in this vitamin. 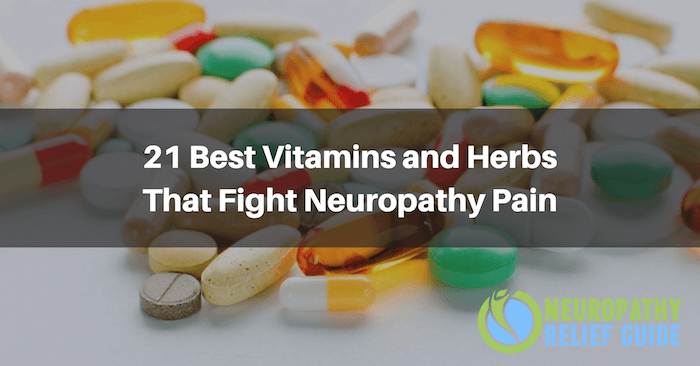 This vitamin is also a valuable substance in treating the issues associated with neuropathy, particularly the one that occurs as a result of chemotherapy treatments. This substance has been tested repeatedly, and was found effective in a 2010 study. The chemotherapy agent used in most treatments has a severe incidence of peripheral neuropathy when used at certain dose levels, and this substance was used in the study. Patients that were on this therapy were also given oral vitamin E supplements, before they began chemotherapy, and three months following their treatment. The severity and incidence of neuropathy was found to be a lot lower in the group taking vitamin E than it was in the control group. The researchers found that vitamin E can help to protect patients from neuropathy over time. Vitamin D is one of the most essential vitamins in the body that is believed to affect virtually every bodily function, including the nerves. Typically, people with either type 1 or type 2 diabetes have low levels of vitamin D.
Those with neuropathic pain often have a vitamin D deficiency. A study was completed in 2008 that looked at 51 different patients and found that taking vitamin D supplements during their treatment led to a 50% reduction in pain levels. Finally, when a peripheral nerve is damaged, surgery that might be used to repair the damage can be unsuccessful and the nerve fails to recover. A study on therapies using vitamin D supplements has found that this substance has the ability to promote nerve regeneration. According to a study in 2008, when plant-derived forms of vitamin D were used on rats with damaged leg nerves, the rats received significant amounts of nerve regeneration and sensory functions were found to improve. Of course, in this particular study, the researchers concluded that further testing would be needed to consider the dosage of vitamin D that might be needed to help humans suffering from neuropathy, but the results indicated that vitamin D does have a huge role to play when it comes to natural ways of regenerating damaged nerves. Acetyl l-carnitine is an amino acid that has been found to be beneficial for the treatment of conditions such as peripheral and diabetic neuropathy, and even Alzheimer’s disease. Most people with this condition have a carnitine deficiency, which has led to research being conducted into its effects. This research has shown that carnitine supplements can reduce insulin resistance, which has a direct effect on how cells can properly use glucose, leading to nerve regeneration. A number of other studies have also shown that acetyl l-carnitine supplements help nerves to regenerate, improve a patients’ ability to feel vibration in their limbs, and reduce pain. Alpha lipoic acid, meanwhile, is produced in each of the body’s cells. Many different bodily functions rely on it for their performance, particularly on how the body metabolizes glucose. Alpha lipoic acid is a fatty acid and a powerful antioxidant. It helps the body convert blood sugar into energy. In Germany, alpha lipoic acid is prescribed to those diagnosed with diabetic neuropathy. Research has shown that people with that condition notice significant improvements because the body is better able to metabolize glucose. Additionally, studies have shown that it improves blood flow to the nerves, thereby ensuring that they are able to effectively use energy. Very promising results have been found through clinical trials. In one trial, it was shown that taking three daily 600mg doses of alpha lipoic acid for a three week period significantly improved neuropathic symptoms. Patients noted that both their pain and burning sensations were reduced significantly after just one week. In 2011, a further trial was conducted showing that those who took one 600mg supplement daily for four years had improved neuropathic symptoms and that progression of the condition had slowed down significantly. R-Alpha Lipoic Acid is one of the most powerful vitamin-like antioxidants on the planet. It is beneficial because of it being both water soluble and fat soluble. This means that it can enter all parts of the cells in the body to properly neutralize pain and free radical damage, which is considered to be one of the main causes of neuropathy. Several studies have shown have shown that regular doses of ALA can provide a reduction in symptoms of neuropathy, including numbness, tingling, pain, and burning when subjects consumed standardized R-ALA regularly. NAC, meanwhile, is also believed to be beneficial as a neuropathy treatment. Specifically, it is a very strong antioxidant that is believed to enhance the function of other antioxidants already in the body, particularly glutathione. 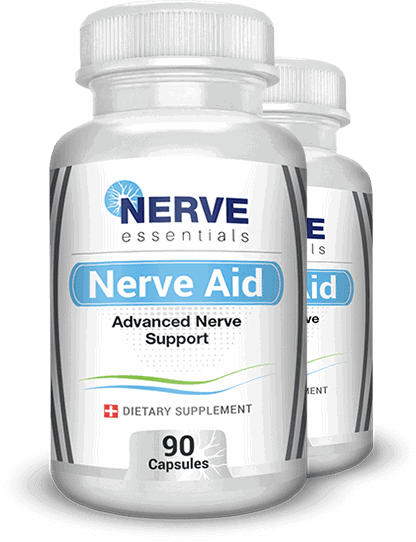 Research has shown that it provides protection from oxidative damage and stress to the nerves. Curcumin, a yellow pigment found in the Curcuma longa plant (turmeric), is believed to help people with nerve damage. That said, little scientific research has been completed on it to date, with studies still ongoing. So far, however, it is believed that curcumin has anti-inflammatory properties and that it might be able to lower pain signals from the nerves, while at the same time preventing oxidative damage from affecting the nerves. Resveratrol is a phytochemical supplement that is found naturally in red wine and grapes. Studies on animals have shown promising results in terms of it protecting against neuropathy because it fights oxidative stress and inflammation. In one study, it was demonstrated that taking resveratrol together with insulin led to a marked reduction in pain sensitivity. Studies have also shown that most people in the western world have a magnesium deficiency. Magnesium is very important, as it helps to clot the blood. Furthermore, it ensures nerve and muscle function is preserved. Research has shown that people who have damaged nerves find their symptoms worsen if they experience a magnesium deficiency. Since our diet alone does not provide us with enough magnesium, supplementation of 400mg taken twice per day is recommended as a treatment. ​Finally, gamma-linolenic acid or GLA, is well known for its ability to assist with nerve function. As an omega-6 essential fatty acid, it helps to promote better functioning in the brain, normal growth, and helps to regulate metabolism and the reproductive system. According to university studies, GLA has been found to reduce nerve pain in those who suffer from neuropathy as a result of diabetes.Importantly, GLA forms part of the protective sheath that is responsible for coating the nerve cells in the first place. However, a diet that is high in trans-fats, sugar, and alcohol can interfere with the enzyme that converts GLA, leading to many deficiencies in this crucial nutrient. Once again, remember to speak to your doctor about the amount of this nutrient that you should take each day before supplementing your diet. For people with problems of nerve pain and damage resulting from a case of diabetes, high levels of blood glucose can frequently lead to nerve damage. Many experts suggest that lack of chromium in the body can be linked to insulin resistance. For this reason, it's often recommended that diabetic individuals take some form of chromium supplement when they want to make sure that the body can use insulin as efficiently as possible, thus, avoiding nerve damage wherever they can. For those looking for a natural way to absorb chromium, the foods that have highest levels of this substance include mushrooms, prunes, broccoli, and wholegrain cereals. Some of the most commonly used herbal ingredients in neuropathy treatment supplements are provided below. For centuries, the extract of the colorful passionflower plant has been used to help alleviate stress and anxiety. It provides a mild sedative effect, but without the drowsiness that frequently accompanies modern medicines; enthusiasts believe that it increases focus and mental clarity, while calming nervousness and reducing inflammatory conditions. A traditional American Indian remedy for infectious diseases and chronic pain, American Skullcap is now cultivated worldwide, and is used as a popular herbal supplement. Like most of the herbs used in treating nerve pain, Skullcap is believed to have calming and anti-inflammatory properties, both of which help with pain management. Oat Straw Extract is procured from green oats, before they are roasted, and is widely available throughout the western world. Its popularity as a health supplement is rooted partly in its properties as an antioxidant, but is also based on a widely-reported calming effect. It may have a much more direct impact on pain management than the calming benefit provided by other herbal supplements, and is a popular ingredient in many neuropathy treatments. A native of Asia Minor, the feverfew plant has been used as a nutritional supplement for hundreds, if not thousands of years, as a preventative measure for the treatment of migraine headaches. In modern times, Feverfew Extract is also taken to help treat irregular menstrual cycles, fevers, asthma, and a host of neurological disorders. GInkgo Biloba has been found in some studies to be effective at helping to manage neuropathy pain and symptoms. In an animal study that was conducted and published in 2009, the results showed that this herb was able to reduce neuropathic pain in rats, though it has yet to be fully tested in humans. This herb may also be a valuable herb choice when it comes to treating neuropathy. This substance contains an essential fatty acid called gamma linolenic acid, or GLA, which has been proven to support optimal nerve function in many studies. One double blind piece of research that was carried out across seven medical centers found that around 480mg of evening primrose oil taken on a daily basis for a year was extremely beneficial to each patient's nerve health. Other studies have found that much higher doses lead to better results, but it is best to consult your doctor for advice regarding doses. This herb is usually used as an anti-depressant, but it is also effective in dealing with polyneuropathy, a neuropathy that is known for affecting a large number of areas across the body, rather than just one place at a time. The herb's antidepressant properties make it a valuable alternative to the usual antidepressants, which can cause a number of side effects. Cayenne pepper generally contains capsaicin, which is a pain relieving substance that can reduce discomfort associated with neuropathy. This substance works by depleting pain-causing chemicals within the blood stream, and removing them from nerve receptors. Applying cayenne pepper in a topical solution can initially stimulate the release of pain hormones, before it depletes it, which leads to a significant decrease in pain. Today, several over-the-counter pain relieving items contain cayenne pepper, and they have been shown to be highly effective in treating nerve related problems - particularly those associated with shingles and diabetic retinopathy. There are many vitamins and herbs for helping neuropathy, with the most beneficial being alpha lipoic acid, benfotiamine, and methyl b-12. You can find these 3 nutrients on Amazon or check out one of the product below which contains all 3 in the clinically studied dosages mentioned above. Regardless, it's important to get these nutrients in your system to heal your nerves, lower your blood sugar, and protect your cells from further anti oxidant damage.